Every magician will have many ideas for the use of Imitation Notes with his Magic ... Notably the ever popular apparent destruction of a borrowed bank note. Such an effect is a traditional one in Magic ... only a magician is crazy or skillful enough in the eyes of the audience to burn or tear a treasury note ... it is direct in appeal and one which always registers with an audience. It is the magic ... or miracle in the eyes of some ... which they expect from a Magician. It is up to the magician to make the most of his effects and the use of Imitation Notes in Treasury Note Tricks will logically enhance any presentation. When an envelope, supposed to contain a borrowed note, is destroyed, members of the audience know that the magician has secretly extracted the contents. Nevertheless, they still enjoy the comedy situation provided the performer plays his part well. It is reasonable also to assume that when an Imitation Note is torn into pieces or burnt to ashes, the audience will realise that the note is not a real one! However, if the performer is a good magician he will make the most of his magic ... and by using an imitation note the effect he creates is more direct, more entertaining and emphatically more surprising ... and it's the effect that counts! It is not the scope of this book to teach Money Magic ... it is assumed that the magician knows his magic ... but to provide the reader with useful magi-gags, ideas and routines to help him to make the most of his use of STAGE MONEY. 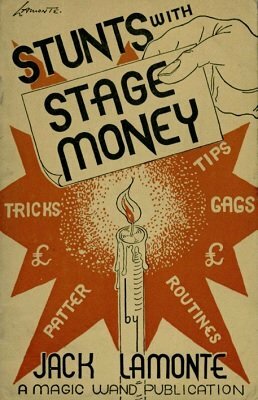 In addition to the burning of a borrowed note and its reproduction in a cigarette, lemon, egg, walnut or what-have-you, for which every magician will have his favourite method ... the following pages will provide further STUNTS WITH STAGE MONEY for use on different occasions. It is my sincere and fervent hope that the reader will not only say to himself "I like that STUNT!" but that he will like and use many of the STUNTS WITH STAGE MONEY. 1st edition 1948, PDF 20 pages.